Thai people in Vietnam with the population of more than one million people, mainly live in the mountainous Northern provinces such as: Lai Chau, Son La, Dien Bien Hoa Binh, Thanh Hoa and Nghe An. Thai people in Vietnam with the population of more than one million people, mainly live in the mountainous Northern provinces such as: Lai Chau, Son La, Dien Bien Hoa Binh, Thanh Hoa and Nghe An. For Thai people in many regions, they often regard the twenty-fifth of December (according to the lunar calendar) as the last and the biggest market of the year. People go to the market to buy everything for Tet Holiday and then relax for Tet Holiday. In the morning of the twenty-seventh and twenty-eighth of December, the elderly and the head of the village urge all people to clean the village. People start wrapping Chung Cake on the twenty-nineth. Thai people often wrap two types of Chung Cake with black and white. To make black cake, they burn the rice straw, take the clear ash, mix with sticky rice, clean the sticky rice but keep the black. In many places, people do not add meat, onion and grean beans into the cake because they think that the flavor of Tet Holiday in Chung Cake mainly expresses in the flavor of Dong leaves and that is the key factor of the earth and sky to offer to the ancestors (home ghost). In the morning of the thirtieth on Tet Holiday, people start boil Chung Cake and pork. New Year’s evening is the final meal of the year with the presence of relatives, friends, and people drink alcohol all night. During the New Year’s Eve, Thai people burn incense all night. After worshiping the New Year’s Eve with fish, meat, cake, brocade, silver items, etc, any family having gong also hit it and dance together. Thai people usually have the custom “calling the soul”. On the evenings of 28th, 29th or 30th on Tet Holiday, they prepare two chickens, one for worshiping the ancestors, another for calling the soul for people in the family. To call the soul, the shaman gets a shirt of each person, ties together and pulls up the shoulder; he holds a burning stick, and then brings it to the gate of the village to call the soul about twice to three times, then calls again at the foot of the stair. After all, the shaman himself ties a black thread on the hand of each family member to avoid evil; if any family member cut the thread, that person will be easy to get illness or bad things. In the morning of the 1st on Tet Holiday, people often get up early, get a little water boiled Chung cake for each person to drink. The women in the family bring “xoi” to the middle compartment for worshiping home ghost (they are not usually allowed to be there). Then they prepare two or three traysto worshiping. The tray placed above is for the ancestors of the husband family and another tray below is for the ancestors of the wife family. After worshiping, all the boys in the family retire to the inner compartment so that the women eat first and this is the only day like that in the 1st day of the New Year. (Women often enjoy meals with or after men). There is an integral dish in the meal on Tet Holiday of Thai people, which is fish with grilled dishes, larb, salted food or dried water, etc. On the 1st day of New Year, Kinh people forbear to visit other people’s houses early, while Thai people flock to houses of each other on this day. They only forbear to throw away “dong” leaves down to the floor and sweep the house on the first day on Tet Holiday. On the evening of 1st day, they organize the Thanksgiving. From the afternoon of the 1st day, young people start going out without being controlled by parents wherever they go and enjoy meals, even they can go out until after the 10th day of Tet Holiday or the full moon day of January. There are many quite exciting games including playing badminton (chicken feather shuttlecock), throwing “con”; “khac luong”, hitting the drum, gong, singing and dancing, etc. 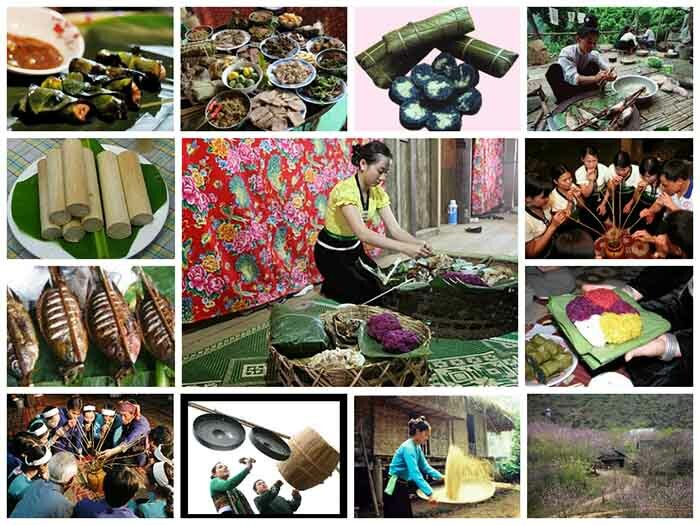 With the aim of helping visitors to have an opportunity to participate in the unique culture and to soak up the Tet atmosphere of the Thai people, Mai Chau Ecolodge will recreate the traditional New Year activities like making Chung cake, five color rice or sticky rice in bamboo tube… Besides the traditional games such as chicken catching, walking on stilts, throwing a sacred ball through the ring,.. visitors also can take part in a wide range of cultural activities. This will certainly be an unforgettable experience for all the guests who stay at Mai Chau Ecolodge during Tet Holiday. This programe applies for those who stay at Mai Chau Ecolodge between 17th and 19th February 2015 (29th – 1st January in the Lunar Calendar). Contact: [email protected] | Tel: +84-4 6275 1271 for more information.